Sukanti & Anushree | OK Listen! Coke Studio MTV Season 4 launchers, ‘Sukanti & Anushree’(S&A), the Earth Electro Duo hails from Kolkata, India. 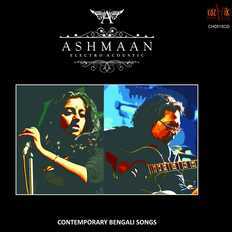 The duo’s debut album titled ‘Ashmaan’ comprising eight original compositions was nominated as ‘Album of the Year’ by Radio Mirchi Music Awards 2014. The duo’s second album titled ‘Centurion Relay’ released in October, 2015. Through this album, the duo pays tribute to the rich heritage of folk music from the Indian subcontinent. Many of the songs are centuries old written by masters, philosophers and thinkers who fearlessly opposed social evils, defied political boundaries and embraced love and spirituality in their purest form. In their simple effort they bring forth eight compositions clad in new age arrangements contemporary to their times. Passing on the baton to the long distance runners...'. Earth Electro duo, Sukanti & Anushree borrows from tradition to create a contemporary sonic landscape that takes the listeners through a thousand moods. Driven by soulful originals, the duo fuses world folk from various parts of South Asia covering Sindh Punjab, Rajasthan, Bengal, Gujarat, Assam, Nepal; middle-east covering Algeria, Egypt and more with an Electronica backdrop creating a psychedelic experience; the search delves deeper every day. S&A’s music blends originals and mystical folk with rock, funk, drum n’ bass creating massive energy and adding a swirling depth on stage that appeals to a diverse audience. They also fuse visuals with their performance that blend with their sound adding to the psychadelia. The duo has been performing exhaustively since 2012 and has been collaborating with various musicians from time to time including eminent bauls(minstrels), percussionists, drummers, rappers, and pure classical vocalists.